We are a proud Eco School. We have our green flag flying proudly near the front gates. In January 2017 we earned our Platinum Award! This is the result of ten years of hard work by the Eco Council, the staff and all the children at Mount Pleasant! We are very proud of this fantastic achievement! Save water by turning off taps. Always put litter in the bins provided. Energy should come from renewable sources. Our school wants to be a healthy schools. Use things as many times as possible. Remember buy local or fair trade produce. Put the car away,walk,cycle or take the bus. Leaving electrical items on standby is wasteful. Always shut doors and windows in winter. The benefits of an eco friendly environment can be enjoyed by all. "The provision for sustainable development is excellent and is a strength of the school. Pupils have a deep understanding of the reasons for re-using materials and conserving energy. Awareness of the need to protect their environment permeates everyday life in the school. Pupils are involved in a wide range of activities, such as recycling spectacles, clothes, paper and plastic, energy conservation and in developing the school grounds to attract wildlife. They have a sound awareness of their role in the wider world through the study of other cultures." We are your new Eco Committee members. If you have any ideas in helping us make the school better, please come and let us know. The Eco-Council at Mount Pleasant Primary School is concerned with environmental issues, such as saving energy, reducing litter and recycling throughout the school. Look at our Eco Board in the school hall, for up to date news and photographs related to the schools eco-friendly efforts. The duties of the class reps include attending meetings, addressing any issues and coming up with new ideas. They are also the designated litter, light and recycle monitors for their classes, trying to ensure that pupils are doing their bit to help. In addition, they also carry out regular litter-picking sessions on the playgrounds and school grounds. Eco Schools is an international programme which rewards schools for working hard on environmental topics to make the world a better place. It works by involving the whole school - pupils, teachers and other staff together with parents and members of the local community. It encourages teamwork and helps to create a shared understanding of what it takes to run a school in a way that respects and enhances the environment. Eco Schools is a recognised award scheme that accredits schools who make a commitment to continuously improve their environmental performance. There are 3 levels of award: Bronze, Silver and the Green Flag. Mount Pleasant has been accredited as a Silver Level Eco-School, due to the good work that has being going on during this academic year. The eco-councillors completed an environmental audit of the school and then devised an action plan, with many targets already being met! We are now working towards achieving Platinum Level. We did it! 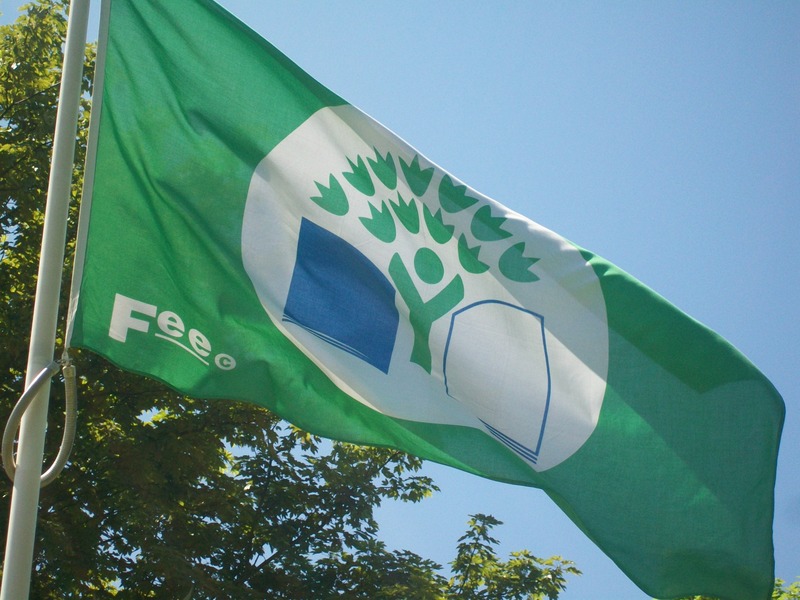 We have now achieved our thrid Eco flag!! !During our last eco inspection in 2014 Mr. Beb, the assessor, gave us a glowing report. He was so impressed by all of the hard work that the eco committee have put in and how well informed our pupils are. Well done everyone!! On Wednesday the 18th of January we were awarded our PLATINUM ECO SCHOOLS AWARD. We have all been working really hard for ten years to achieve this fantastic award.So it is not only this years amazing Eco Committee, but the past ten eco committees that we need to say an enormous thank you to as well. This is team work at it's best. Please follow the link to see the photos of the children presenting their presentation to the Eco inspector and also the team with our much awaited award. We will keep you updated on our next steps to all that is going on in school with TEAM ECO.So please keep checking the website for updates. in the Wildlife Wizards Quiz, as we have done over the last 4 years. We are all very excited about this and have been swatting up and revising our British wildlife knowledge. We will keep you posted on how things are going and how we do during the heats! 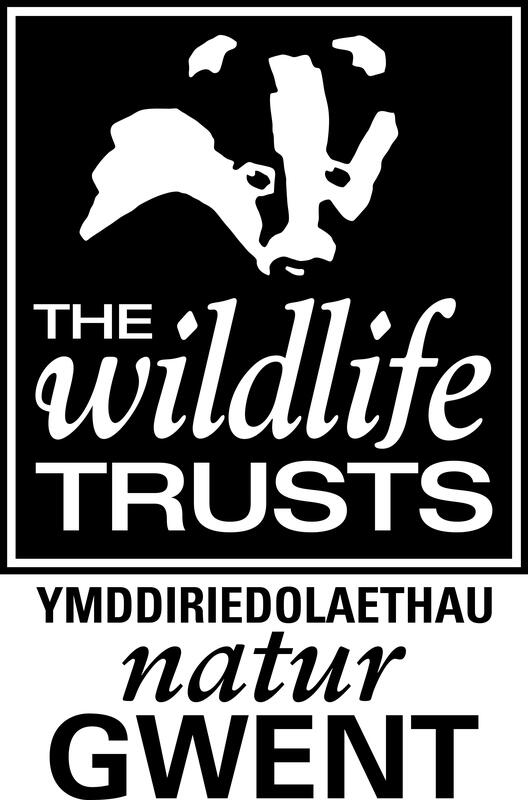 We would also like to thank the Gwent Wildlife Trust for inviting us to participate in the quiz. Year 4 pupils have been very busy making a super short film about Eco in Mount Pleasant. Well done girls!! You are all Eco super stars!!!!! 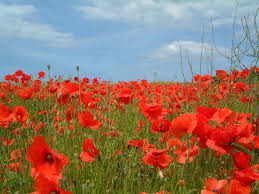 Flanders Poppy Seeds to commemorate the 70th anniversary of The D-Day Landings. 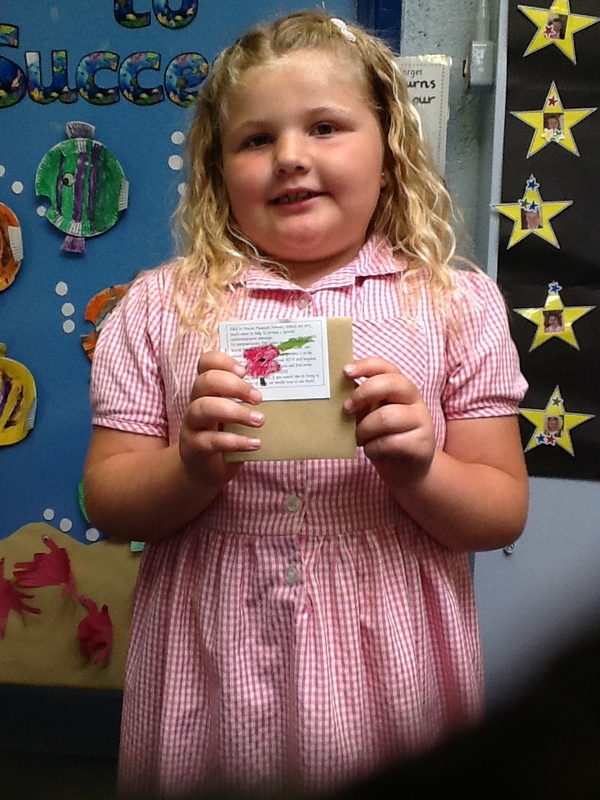 Thank you to Eleanor who was a HUGE help in packaging the seeds! We now have a lovely new flower bed at the front of our school- thank you to Pentrepoeth for the idea!! We are looking forward to fillng it with plants! 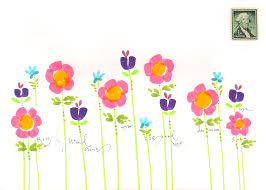 Well done to everyone who applied for the eco committee this year! We had lots of super applications and very good interviews. We now have a great new Eco- Committee for this year, who are happy to take your suggestions and make our school a super eco friendly place! If you would like to join the Eco Committee next year, then please fill out an application form. You can find the forms on the pupil notice baord in the hall or click the tab on the left hand side. We look forward to hearing from you! Mount Pleasant has now joined the RSPB. We now have access to a super range of magazines and books all about wildlife. These will be available for the children to read, complete puzzles and send in work. The magazines and books will be in all of the classrooms across the school. We are already enjoying looking at our new magazines!! 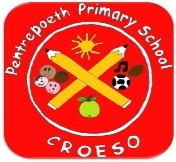 We now have an email eco-link with Pentrepoeth Primary School. We are now sharing links, ideas and tips with Pentrepoeth. Click on the logo to visit their Eco blog. We now have more plastic recycling bins around the school, including the satff room. Please make sure we are reducing, re-using and recycling as much as we possibly can. 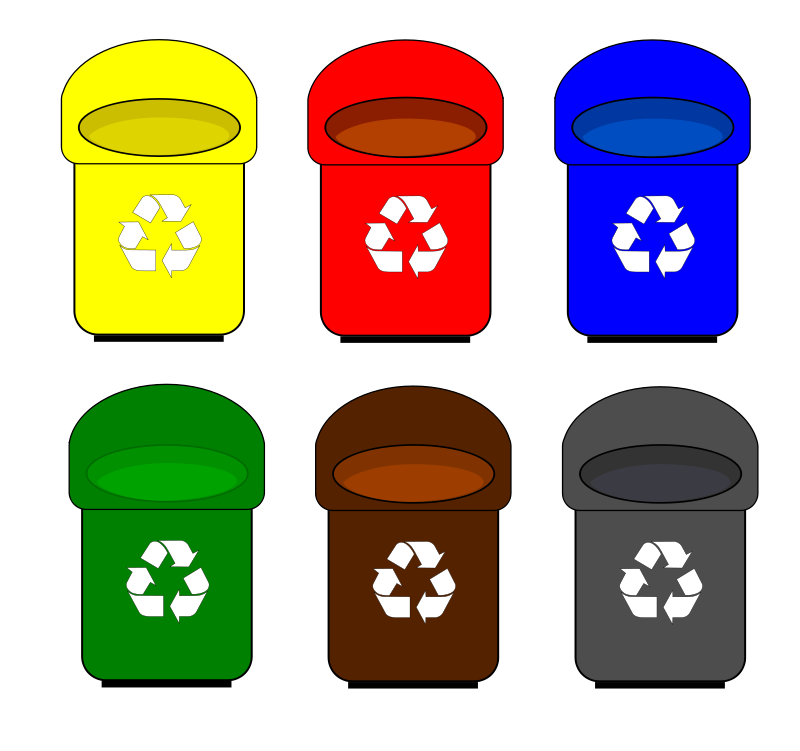 Find out why it is so important by clicking on the recycling bins below. Well done to our new Eco paper collectors for remembering to collect the paper every Friday, you are really making a difference. A BIG WELL DONE TO THE ECO COMMITTEE FOR AN EXCELLENT ECO PLAY TODAY FOR ECO DAY!!!!! A full day devoted to environmental issues!! Children and staff wore green clothes for the day and all classes focused on a key environmental topic (see below). The eco-council opened the day with an informative and fun eco-themed play. All classes then spent the day working on eco-themed projects. On Friday the 15th of November Mr Craig McKenzie store director from SpecSavers, Newport came into school to collect the 120 pairs of unwanted glasses that you have kindly donated. Two of our current Eco Committee members presented the glasses to Mr McKenzie in our good news assembly. These glasses will now be sent to Vision Aid Overseas to help people in third world countries. Please continue to bring your unwanted glasses into school throughout the year for our collection next year. Many congratulations to two of our fantastic pupils for all of their fantastic work in their Eco Diaries. This work was entered into an international competition run by Panasonic. Last week we heard from Panasonic to tell us that, they were so impressed with the high standard of the girl's work and that they had won a Lumix TZ20 camara. Well done girls we are so proud of you both. On the 24th January Miss Waller (enviromental officer) came into school to do an assembly for the staff and children about looking after birds in winter. It may be winter but we have still been busy with a number of green related issues. One billion Christmas cards, that's 17 for every man, woman and child, could end up in the rubbish bins across the uk. For every 3,000 Christmas cards, we will use one tree. This means a huge amount of natural resources could end up in handfill. Each primary school in Newport had the chance to enter a competition to collect as many cards as they could over the Christmas period. The winning school would receive a £150 eco equipment of their choice, 2nd prize would be a £50 voucher and 3rd prize a compost bin. This year we collected 13,641 Christmas cards a fantastic amount, so a very big thank you to everyone who very kindly donated to our collection. Please ask all of your family, friends and neighbours to keep their cards next year to our competition. The school which won this year was Ysgol Gymraeg Terynon. We have been working very hard making Michael Recycle our new school Eco mascot. Last term we asked for you to recycle all unwanted items that were purple and green, so that we could make Michael from them. The Eco committee have worked very hard drawing, sticking and making our fantastic Eco mascot. Michael is now flying high in the school hall asking us all to be his Eco Buddies and help him to take care of our beatuiful world. Every year the RSPB asks children across the UK to count the birds in their school grounds. Each class spent time watching a variety of birds and recorded their bird watching data. Our data was then emailed from all classes to the RSPB, enabling them to compare it to earlier years, so that they could spot any trends or changes. Idenifying and helping species that are in trouble. In previos years data collected from the Big Schools Bird Watch has noticed a dramatic decline in house sparrows and starlings. The data we have collected have also shown us which birds like living in and around the school grounds, enabling us to grow a variety of plants to attract birds and insects. A fun time was had by all of the staff and children, using very many key skills. This week here at Mount Pleasant some of the children on the Eco committee have been helping to maintain our willow dome. Miss Waller ( Biodiverity Officer) for Newport City Council came in to guide and support us. The longer shoots were pruned and replanted in the spaces in between the existing willow, to allow our dome to become a more solid stable structure. The smaller shoots were then woven into the dome. On wednesday 6th March the Gregory Brothers visted our school with their road show, entited 'Tiny Ted & Eco Eli Road Show'. Tidy Ted and Eco Eli were the main characters in the show and were supported by the puppet Spick & Span. The aim of the road show was to promote and stimulate the children's, interest and awareness of envoirmental issues such us, recycling, litter, waste, dog fouling and graffiti. There was a fun atmosphere and all of the children and staff really enjoyed participating. The songs are great fun and we are sure your children will want to teach them to you. If you would like to learn these fantastic songs with your children please pop into school and ask to borrow one of the cds. 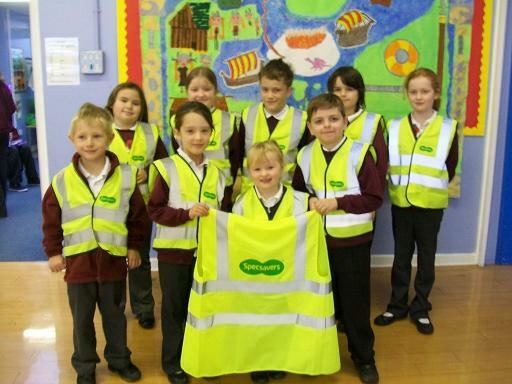 We have recently received from Spec Savers of newport, 150 High Visibility Vests. The reason for this kind donation was that Mr Jason Williams (Area Manager) for the company came at the end of last year to collect on behalf of Vision Aid Overseas 87 pairs of adult and children's unwanted glasses that many of you kindly donated. Mr Williams felt that this was a super reason for them to reward our efforts here at Mount Pleasant. The vests are to be used by all of the children in both key stages and Mr Williams was thanked by the Eco committee for this kind donation. We have been working very hard to create a bug hotel for the bugs and animals that live in our forest school area. The forest school club helped us to use a range of materials to build it. Thank you to everyone who donated materials!